This page explains how to travel between Hangzhou and Huangshan by direct high speed trains, or go via Shangrao by a connecting train if the only one direct train sells out. Furthure more, you can also go by bus from Hangzhou West Station to Huangshan Tunxi. How far is Huangshan from Hangzhou: The distance is 430 kilometers. How to get from Hangzhou to Huangshan: By train, bus. The railroads in red and orange are high speed rails for G and D trains, while the green railways are regular rails for T, K, Z trains. 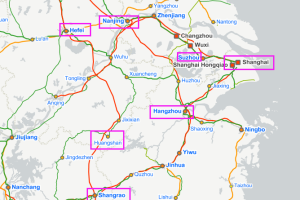 You high speed trains travel on this route: Hangzhou – Shangrao – Wuyuan – Huangshan. A new high speed rail (Hangzhou Huangshan Intercity Railway) linking Hangzhou and Huangshan is going to open on January 5, 2019, shortening the current travel time between Hangzhou East Railway Station and Huangshan North Railway Station from 3.5 hours to 1.5 hours. 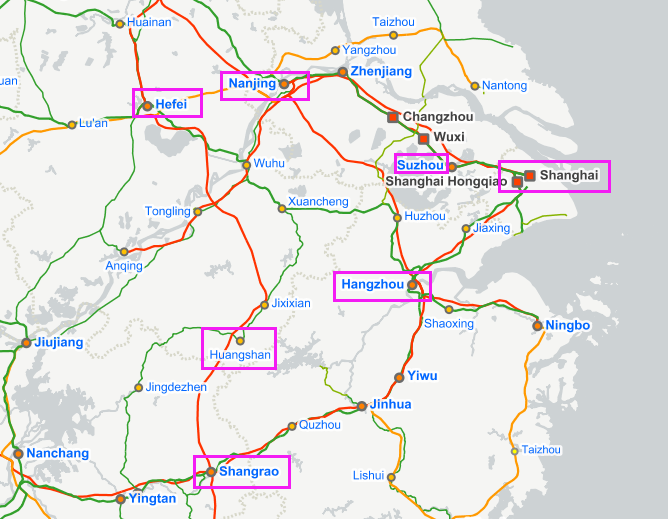 The intercity railway extends in east from Hangzhou East Station and Hangzhou South Station, passing through Fuyang, Tonglu, Jiande, Qiandaohu (Qiandao Lake), Sanyang, Jixi North, Shexian North then finally reachs Huangshan North in the west, accommodating high speed trains with a top speed of 250 km/h. From January 5, 2019, there will be 33-36 high speed trains running between Hangzhou and Huangshan. New high speed timetable will be added online soon. If you have any questions on your Hangzhou – Huangshan train travel, just contact Jack at chinatrain12306@gmail.com, I’d love to offer help. Refer to ask Jack for more details. As of December, 2018, there are two daily high speed trains running between Hangzhou and Huangshan, using Hangzhou East Railway Station and Huangshan North Station. Hangzhou East Railway Station (HangzhouDong, 杭州东站) can be reached by metro line 1 and line 4 (at East Railway Station). Huangshan North Railway Station (HuangshanBei, 黄山北站) can be reached by the local bus or taxi. More information at the page Huangshan North Train Station. Buy at train stations: Foreign travellers can buy train tickets in any train stations in Hangzhou, including Hangzhou East, Hangzhou Railway Station, Hangzhou South, etc. Or buy in train stations in Huangshan: Huangshan North or Huangshan Railway Station with your passport. China train tickets go on sale in train stations 28 days prior to travel date. www.china-diy-travel.com/en/, Helen offers help (use Promo Code: ct123 to reduce service fee). You can place your order anytime with the above online agents, who will buy the tickets for you once released. They can even deliver tickets to your hotel. They will also provide you professional help on how to get to the train station, how to ride a taxi or a metro, how to take your train or even offer one-to-one help when you run into trouble. You can have a flexible option with more high speed trains by splitting your journey: Hangzhou – Shangrao (Shangrao Railway Station) – Huangshan. Just get from Hangzhou/Huangshan to Shangrao first, then take a connecting train to Huangshan/Hangzhou. Remember to allow yourself at least 50 minutes connection time for catching your next train. If you want to travel between Hangzhou and Huangshan, here is great resource for you: https://littlegreybox.net/2015/08/03/how-to-get-from-hangzhou-to-huangshan/ . There are buses running between Hangzhou West Bus Station and Huangshan Bus Station in Tunxi, taking about 2.5-3 hours.